I know it's been a while since i've posted, but i know very few people read this blog anyway. I went home to Vermont for Thanksgiving break, which was nice. my allergies kicked in of course, but that's alright. Thanksgiving is quite different for my family now that it used to be. I miss our whole Depatie family getting together at my Aunt Therese's and i especially miss her famous bread rolls! But our family is growing too big, so meals together just doesn't work, no one's house is big enough for a sit down meal with all of us. So we are starting to just have our family and sometimes my mom's sister and her family, or we go to their house. and this year we have a new member of the family! 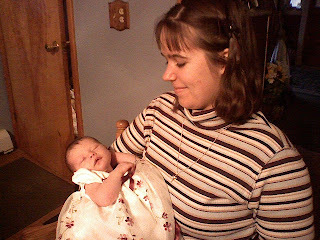 I am now an aunt, and my new niece Pheobe Marie is only 2-3 weeks old. She's so cute! Besides seeing her, I also got to see the new shrine for the tabernacle that Fr. Ben has had completed, and it is beautiful. I'm very hopeful about the prospect of going back to Vermont. I see a lot of good reforms in my home parishes, and there has definitely been receptivity to changes in music, but they need help in that department for it to be more consistent. My grandmother actually wants to try to teach the choir a latin gloria and other mass parts. both parish now sing the Agnus Dei strongly, so it is time to start doing another part of the mass in latin as well. One piece at a time... My home parishes also seems like the ideal place to start in Vermont since the parishes already have organists, so i wouldn't be desparately needed to play, although i am learning organ, and getting better at it. I got to introduce myself to the bishop as well, and express my interest in music for the diocese, so we'll see what happens. I think it is safe for me to say now that there ARE opportunities in Vermont for me, now i just need to discern if that is where God wants me to go. So prayers for that please. It is so funny that you posted, because i've been thinking about you lately, after having been at the mass on Saturday that the bishop celebrated, and definitely planned to talk to you when i come home in a couple weeks for Christmas break. I was going to let you know that in December (from the 15th onward) if you are playing for mass and would like me to sing with you, i would be glad to. I am giving serious thought of returning to Swanton and Highgate to help form a more consistent and joint music program for the two parishes in some way, and have a lot of ideas, so thank you for praying for me while i discern this possibility with Fr. Ben. The more I have seen and heard the music in Highgate and Swanton when I come home, the more hope I think there is for reform of the music and the liturgy. God bless, see you soon. I would be absolutley honored to have you participate in any Mass that I am involved in. Keep in mind that I have not played for a soloist in years only for myself so I improvise alot. My biggest obstacle is practicing, ( and I really have to practice long and hard before I play for any Mass), but if we keep things simple I am sue that we can work something out. According to the Nativity schedule I am supposed to play the Vigil for The Feast of the Immacualte Conception on Decemember 7, and again on Christmas morning at 10 a.m.. Call me when you get home and we will try to make a plan. You must have some mid-term exams coming up? Good Luck, Take Care and God Bless!! Some people are reading it, Kim - the strangest sorts! Keep the faith! Hi Kim! I still visit! :) Congrats on becoming an Aunty, my first niece is just over a year old and is such a wonderful little person... and she sure does enjoy singing at Mass!! I check in from time to time too. Hello Art!